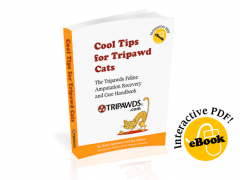 In the spirit of Hoppy Holiday giving, we’d like you to have your own free Tripawds calendar. In fact, you can have as many as you want! High Resolution Calendar File (20 MB) – prepared for high quality printing. Allow ample time for download. Low Resolution Calendar File (3 MB) – optimized for fast download, with minimal print quality degradation. 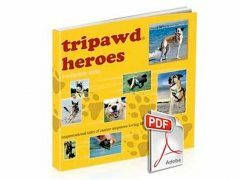 These 28 page PDF Calendars include full color images of some the most inspawrational members of the Tripawds Community. These three legged heroes from the past and present are paired with inspirational quotes that serve as monthly reminders to enjoy every day to the fullest. Moon phases are included as are all popular holidays – including Underdog Day, Squirrel Appreciation Day, and of course, the Feast of Saint Francis. Tips for Best Printing Results: If printing on your home printer, print all the odd pages, then print the even pages on the back sides. Select “Reduce to Printer Margins” in the print dialogue box to ensure nothing gets trimmed off. Or take the file to your favorite copy shop and have them print the document double-sided and have them bind it across the top. Either way a white border will remain around all pages. Print a couple pages first to ensure positioning is correct for hanging on the wall. Looking for a high quality, professionally bound calendar with full bleed images on heavyweight glossy paper? 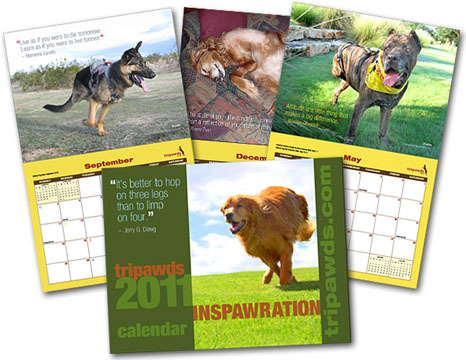 Get your 2011 Tripawds Inspawration Calendars from the Tripawds Gift Shop! These beautiful calendars make great gifts! 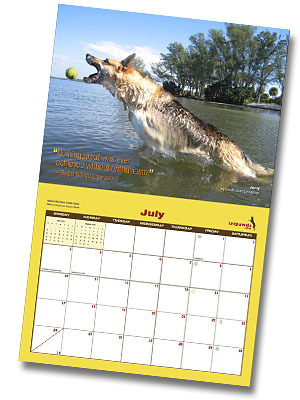 There is even an inexpensive 11″ x 17″ 2011 Tripawds Calendar Print perfect for any vet’s office or waiting room.